Like its predecessor (the Giselle Earrings) this necklace exhibits charm and delicacy on its wearer. Make it in your favorite crochet thread and complement it with your choice of beads. The beauty of this pattern is that it works up quick and easy. If you like, use a little craft glue to stiffen the ends of the thread to prevent fraying after wear. Cut thread 8-10 inches (20-25.5cm) down, this is your yarn tail; do not knot or weave in. Insert hook into the open loop of one circle (call it circle one). With one loop on the hook, sl st into side of 2nd circle opposite of 2nd circle’s open loop, sl st into the next dc of 2nd circle and then back into sl st on circle one. Attach next three circles in same manner. 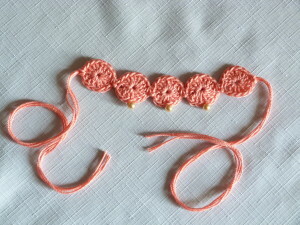 Using the first tail of each circle, sew bead onto bottom of the three circles in the middle. Cut 4 – 14” strands of yarn, take two and knot like a tassel on the last circle. Repeat for other end. If you have any questions or comments, leave them in the comments section below and I’ll get back to you as soon as possible! This entry was posted on Saturday, September 13th, 2014 at 12:00 AM by Amy	and is filed under Free Crochet Patterns. You can follow any responses to this entry through the RSS 2.0 feed. You can skip to the end and leave a response. Pinging is currently not allowed. If I get to it before Christmas Would you like me to send a picture of it?? That’s a wonderful idea, I would love to see a picture of it! The open loop is the working loop. When you complete the sl st of a circle you still have a loop on the hook until you knot it. In this case you don’t want to knot it. You will put your hook back through the loop and use that loop to work into another circle. Does this help?